Reflections on painter Van Tho's book titled "Van Gogh's Eye , Van Tho's Eye - Vietnamese Comtemporary Painting"
For me , Van Tho has been the first and only artist in Vietnam who is blessed with qualities of the three geniuses of the modern painting world : Picasso , Matisse and Van Gogh . They have four characteristics in common : First , they are motivated by impulsive passion . Second , they reflect the unrest of the instinct of painting . Third , they are all directed toward a sublime art which is universal - extending across national boundaries and not repetitious of traditional motifs , colors and lines . They create a "daunting art". Fourth and last , they are architects of visual art . Wherever Van Tho's works are placed , they will make the surroundings look lively , splendid , and opulent . They create a respectful and invaluable cultural space . (It would be astonishing to catch sight of his paintings in a rural area.) His paintings have penetrated the era and reached the level that has rarely been surpassed where , the painter discovers a new point of view - an unexpected escape - in technique and in painting processes and use of colour , as well as in the use of metaphor . He has great strength , decisiveness and instinctive intelligence . He has the precision of an architect , along with the painters eye for the use of colors , media and shapes . (That reflects an old persons wisdom but a childs behavior.) And he makes vital use of modern architecture . Van Tho's paintings contribute to enlivening space and heightening its value . They are best placed in modern , intellectual and simple architectural spaces . They are on a par with the works created by world-famous architects from the past such as Mies van de Rode , Walter Gropius , Louis Kahn and Le Corbusier , as well as young architects in the present days such as Zaha Hadid , Daniel Libeskind and Remkoohaas . 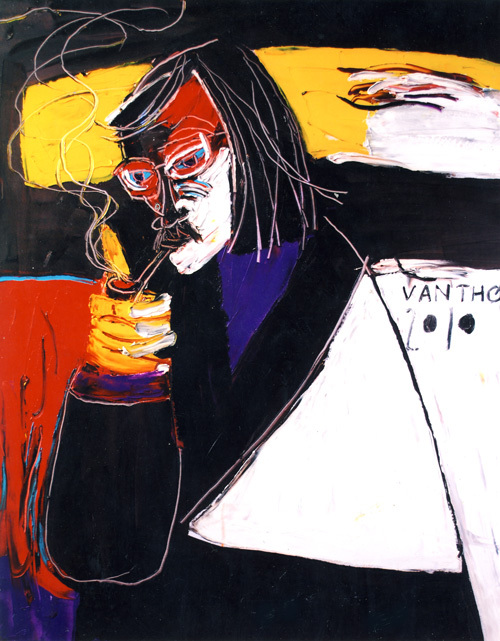 Van Tho's paintings are completely different from the works of other artists in present day Vietnam . They reflect a new language of art , a new way of thinking , and a new way of expression . They also reflect an atypical conception . 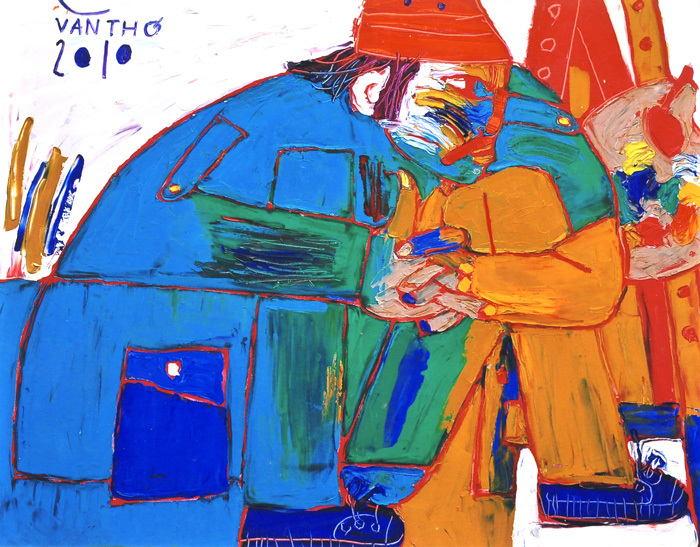 Viewers can find in his works the "fire" and "emotion" that are rarely found in others . From his hands and brain , his works emerge beautiful , satisfying , rich and native . He is able to find the most unusual object , the most limited or unlimited spaces , the most standard painting medium and color , the closest and most dynamic layout , the most unexpected escape and the grittiest aspect for each of his paintings . The bigger his paintings are , the more frightening they are . They depict things that surpass the boundaries of the painting size . His paintings bring fellings to viewers of sublimity , pleasure and strangeness . Each of them is a distinct flame , which cannot be found in any other painters works . Its not advisable to place other painters works near his . Whenever I find myself hard-pressed for creative ideas , I turn to him . He is a warm bloodstream , a raging flame and a rich source of inspiration for me . I am an architect . I can handle the technical part . He always show me a soltion to any problem in creating art . Thanks to him , I learnt to be open to any cicumstance . Everything can happen and exist .What a knowledgeable and impulsive man! I have diplayed other painters works in my creative space and found it turned ordinry .I had to replace them with his paintings .They are "expensive " and of high quality .They make my space sublime , holy, and luminous .They feed me with inspiration for actistic creation. His painting have no need of a specific content or model .He paints on impulse .For hm ,to paintis as if to eat or breathe .He has no need for a target .He pays attention only to expressing on cavas the forms which are smoldering and suffused in him. He pays little attention to content but more to from . (All great artists seem to be like that!) He is inspired by emotions .As a result his painting are normally not named until they are completed .Objectives are sit in other situation but not in arisic ones .When holding the brush ,he paints without any outcome in mind .Initially , the act of painting takes place spontanneously and unconsiouly .Then comes the intention .He doesnt know what he has created until the works is finished .The title is created as the final stage of the process . Emotion is perceived with one eye only . 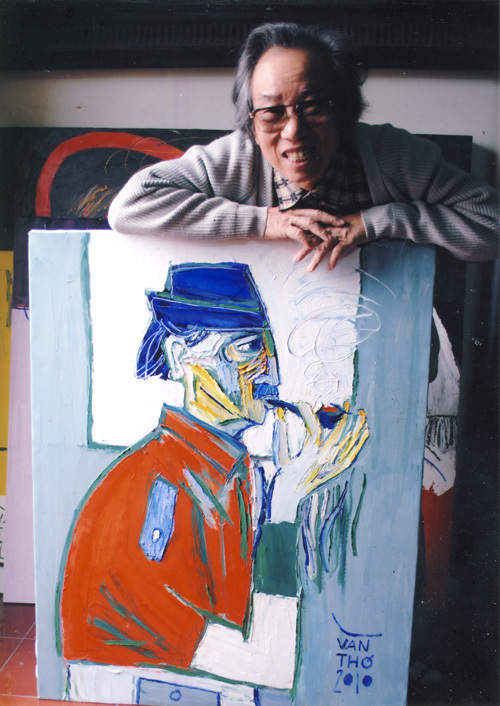 Viewers find in Van Tho's paintings aspirations , simplicity , deep-tooted sentiments , excitement , meditations , depression and exuberance . They find the heart , soul and "unconscious" aspect of the artist . Reason is perceived with both eyes . It tells the artist if he needs to add , lessen or clarify something in his works . It tells the artist that perfection is not impossible and that one thing will lead to another . It has no relation with emotion . It refers to the "conscious" aspect of the artist . I have not been to Van Tho's house although I have cherished that intention for a long time . I cannot go there to have a look at his painting only . I can only go there with some money in my pocket . What makes me feel most regretful is that I have not been able to afford oneof his paintings .